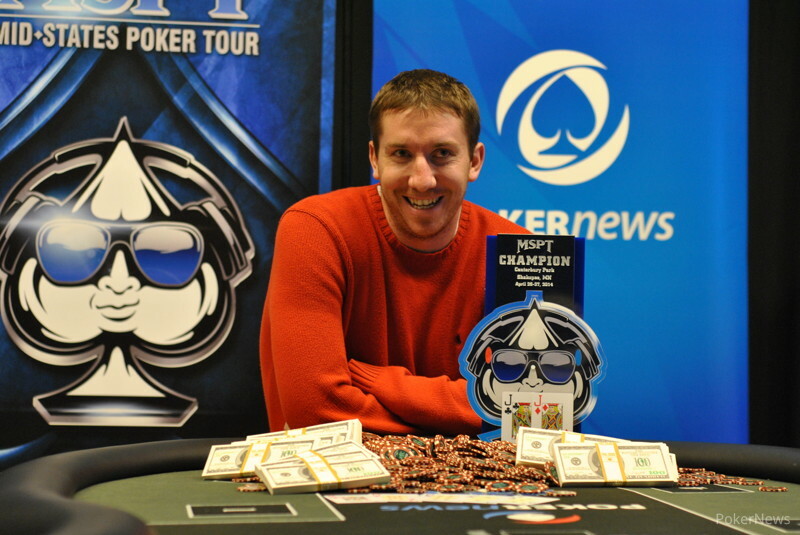 Mike Wilmes topped a Minnesota-record field of 447 runners to take down the 2014 Mid-States Poker Tour Canterbury Park Main Event for $108,984. 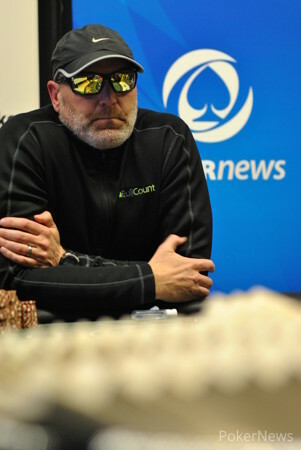 The score is more than four times Wilmes' total recorded live tournament winnings. The Roseville native triumphed after roughly 13 hours of play on Day 2. 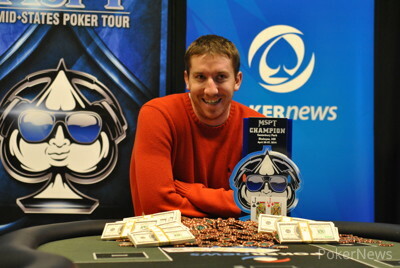 The key pot that vaulted Wilmes into prime chip position came in Level 22 (8,000/16,000/2,000). Three players saw a flop for what appeared to be 100,000 each. Ken Pates checked, Todd Lyfoung bet 80,000, and Wilmes made it 250,000 on the button. Pates announced a reraise and he pushed 500,000 into the middle. Lyfoung got out of the way, and Wilmes moved all in for 621,000. Pates called. Wilmes had a massive combo draw, while Pates had flopped middle set. The was a brick on the turn, but the dealer placed down the on the river, giving Wilmes the stone nuts and the win. The high school math teacher grabbed the chip lead with that massive pot, and he stayed on cruise control to the final table, which he entered as the man to catch. 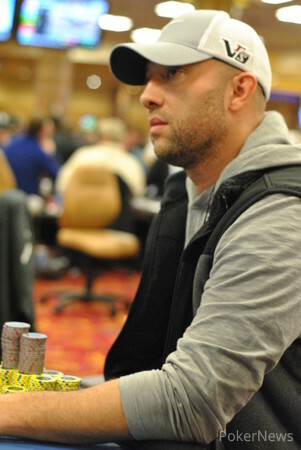 Brian Soja, who claimed second place at this very tournament last year for about $50,000, was the first to fall when he ran the into the of eventual runner-up Mike Lang. Wilmes then busted Dennis Stevermer in ninth when his live cards out ran Stevermer all in preflop. Wilmes then stayed out of all-in confrontations, protecting his stack as Tony Lazar and Jason Smith fell by the wayside in eighth and seventh, respectively. Then, Jerome Getz bowed out in sixth when he ran the into the of Lang. Lang made the next elimination as well, playing himself into an interesting spot by just calling with a big hand preflop. Pates raised to 170,000 on the button, and Lang defended his big blind with a call. Lang checked to the raiser on the flop, and Pates fired 225,000. Lang raised it to 500,000, and Pates announced a deep-voiced all-in shove. Lang tanked for a long few minutes before voicing a call. Lang was in a great spot, needing to fade only a three, while a pair on the board below kings would chop it for Pates. The and kept it clean for Lang, and Pates had to settle for fifth place. Wilmes then dragged another key pot when he four-bet jammed on a flop against Jim Lawrence, who found a fold despite putting in about half of his stack. Wilmes finished him off shortly thereafter, and three-handed play took on a distinctly heads-up feel, as Wilmes and Lang battled back and forth while Behling mostly lurked on the sidelines. Finally, Behling picked his spot, and it was a good one. He opened to 180,000 on the button, and Wilmes shipped it in from the big blind. Behling called off his 1.4 million after thinking for a couple of minutes. Wilmes had been caught shipping light, but the flop bailed him out with a pair. Behling slammed a few chips with frustration as the turned, leaving him drawing to three outs. The didn't help him on the river, and the beat sent him to the payout desk. Mike Lang called on the button, and Mike Wilmes popped it to 280,000. Lang woke up with another raise to 480,000, and Wilmes responded with 780,000. Lang had overstepped his bounds with ace-high, and the flop gave him merely deuces. A was a brick turn. "Ace on the river," Lang willed. Wilmes' request was granted: a fell, ending the tournament. Harry Behling opened to 180,000 on the button, and Mike Wilmes shipped it in the big blind. Behling called off his 1.4 million after thinking for a couple of minutes. Wilmes had been caught shipping light, but the flop bailed him out with a pair. Behling slammed a few chips with frustration as the turned, leaving him drawing to three outs. The didn't help him, and the beat sent him to the payout desk. Mike Wilmes opened for 170,000 on the button, and Mike Lang popped it to 320,000 in the big blind. Wilmes called, and the hit the board. Lang bet 400,000 and got called. A didn't slow him down, and he came out with 500,000. Wilmes mucked his cards, and Lang has taken the chip lead. Mike Wilmes opened for 170,000 on the button, and Mike Lang defended his big blind. Lang check-called 190,000 on the flop, and a paired the board. Wilmes bet hefty this time, 430,000 after Lang checked. Lang leaned back in his chair and announced a raise to 1 million. Wilmes mucked his cards after some thinking time. The two Mikes are now separated by just a few big blinds. 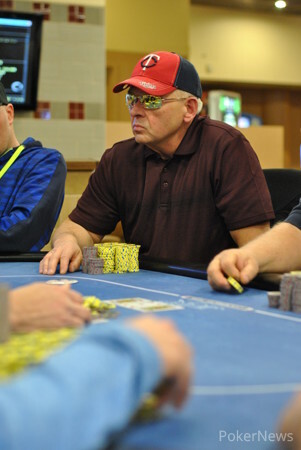 After the elimination of Jim Lawrence, Mike Wilmes has more than half of the chips in play. Jim Lawrence just got eliminated in a hand we didn't see. According to the tournament staff, he got it all in after a flop against the of Mike Wilmes. Lawrence had flopped two pair with , but Wilmes rivered a for a straight.